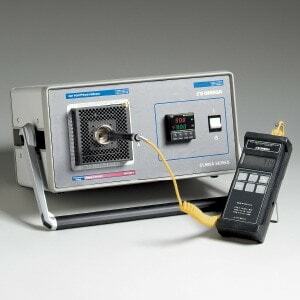 This article from OMEGA Engineering discusses the calibration of temperature sensors employed in manufacturing and temperature recording, including why and how frequently sensors need calibrating. Calibration equipment options and reasons for and against using an AS17025 calibration laboratory is covered also. Bimetal or spring-type thermometers. Widely used despite their slow response and lack of accuracy as they are inexpensive and easily adjusted. Thermocouples. 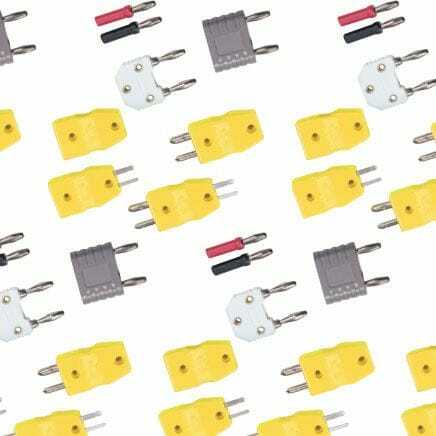 The most widely used industrial sensor, consisting of two dissimilar metal wires joined at one end, these produce a voltage proportional to temperature. Resistance-temperature detectors (RTD’s). Typically wound from platinum wire, these are expensive but give rapid response and good measurement accuracy. Thermistors. These semiconductor-based devices measure temperature over a limited range and are often used in medical applications. Infrared (IR) radiation detectors. These non-contact sensors measure surface temperature and fall into one of two types: IR pyrometers and thermal imaging cameras. Use of both is growing rapidly as many more products come on to the market. Absent from this list are liquid-glass thermometers. These cannot be calibrated as their lack of adjustability means it is only possible to note the error. Additionally, there are concerns over the risk of breakage, especially with traditional mercury thermometers. In many industries controlling temperature is insufficient: it is important to have documentation of the temperature or thermal cycle to which the product was subjected. Such logs are required in food processing and pharmaceutical production and storage. This can be accomplished by temperature controllers with recording capabilities. For safety-critical items such as wheel hubs, suspension linkages or brake components, documentation helps a manufacturer prove that a part was heat-treated correctly and was neither too brittle nor too soft. An area of increasing importance is the production of carbon fiber components for automotive and aerospace use. 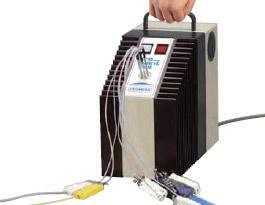 As with other curing processes, temperature and pressure must be precisely controlled. Even in situations where temperature control is not essential for product performance, repeatability is needed for product consistency. Quality Management Systems universally require calibration of all measuring equipment that can affect final product quality. While calibration of gauging equipment is usually understood,the importance of calibrating temperature sensors is sometimes overlooked. Every device used for process-critical measurements should be checked periodically to verify it continues to deliver the required accuracy. Where adjustment is possible, a device measuring outside of expected limits should be brought back to an acceptable performance level, but in the case of non-adjustable equipment the deviation or measurement performance should be recorded and a decision made on whether it remains fit for purpose. In the case of temperature measurement equipment, the properties of bimetals and thermocouple wire change with use and time (especially when used at elevated temperatures) resulting in measurement drift. Additionally, a thermocouple probe may be damaged in service, possibly mechanically or by corrosion, resulting in rapid deterioration of the wire. RTD’s and thermistors are also both fragile devices and easily damaged, so should be checked periodically. The same applies for IR thermometers and thermal imaging cameras. Quality standards generally leave it to the user to decide how often a device should be calibrated. However, an auditor will expect a sound justification for whatever frequency is given. When establishing a calibration frequency consideration should be given to type of use the device sees, the risk of damage and the rate of drift (which can be determined from historical calibration records). Procedures should be implemented defining the actions needed if calibration shows a device is operating outside of acceptable limits. For example, a product manufactured since the last calibration may need to be recalled (and the cost of doing so may influence calibration frequency). In safety critical situations such as food or pharmaceutical production calibration may need performing everyday or even every shift. The simplest way to calibrate a temperature sensor is to check how it reads the temperature of two physical constants: the temperature at which ice melts and the boiling point of water (although the latter should be corrected for atmospheric pressure). While quick and inexpensive, one weakness of this method is that it is typically not a NIST traceable calibration. 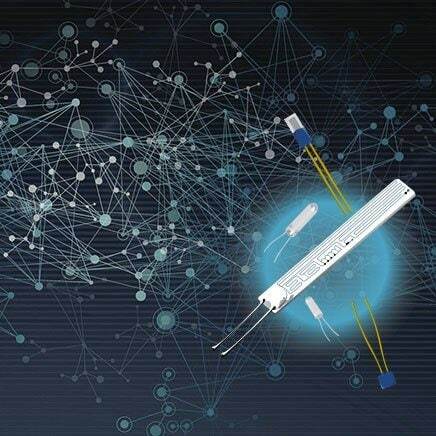 Dry block probe calibrators overcome this problem and provide a quick and accurate means of calibrating thermistor, thermocouple and RTD probes. 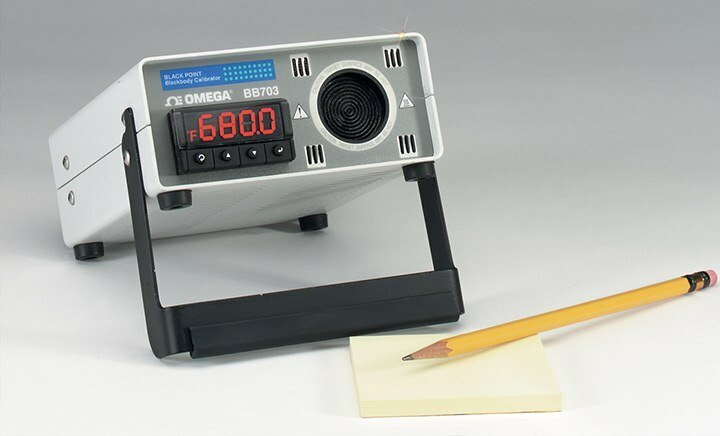 A calibrator like OMEGA’s hot point® Dry Block Probe Calibrator is used to heat a thermocouple to a chosen temperature and the reading on the indicator compared with that on the Calibrator. 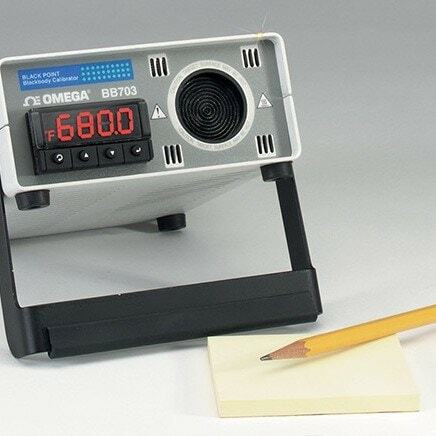 Next, an ice point® Reference Cell such as the OMEGA TRCIII is used to provide the 0oC comparison temperature. Again, the indicated reading is compared with that on the calibrator. Corrections can be determined from these two measurements. Thermocouple operation can also be verified by simulating the electrical signal produced by the probe and checking the expected reading against that indicated. Infrared Blackbody Calibrators are used for calibrating noncontact temperature measurement equipment such as thermal cameras and pyrometers. These use a surface of “perfect” emissivity (between 0.95 and 0.98) that is heated to a known temperature and compared with the reading from the device. (Note that while accuracy depends on the quality of the temperature measurement within the Blackbody Calibrator, and may only be with 1%, repeatability should be very high). Calibrate In-house Or Use a Calibration Lab? For most organizations the determining factors are the volume of calibration work to be performed and the availability of inhouse resources. If gauge calibration is already performed, adding temperature sensors to the list of equipment requires only investment in a dry block probe or blackbody calibrator. However, some external calibration is always needed to ensure NIST traceability. Just as ISO9000 provides a Quality Management framework for manufacturing companies, AS17025 (the US interpretation of ISO 17025) does the same for calibration laboratories. Defined procedures document the methods used for the calibration work undertaken, ensuring methods are robust and provide an appropriate level of NIST traceability. Significant emphasis is placed on communicating results to customers, and this includes information on measurement uncertainty. A lab not meeting the requirements of ISO 17025 may perform satisfactory calibration work with appropriate levels of traceability. However, formal accreditation means a customer can be confident that appropriate procedures will be followed and so is spared the expense of verifying this for themselves. Many manufacturing processes use heat to modify product characteristics. In some cases precise temperature control is essential to ensure fitness for purpose, and a paper trail (temperature logs plus evidence of calibration) verifies the manufacturer took appropriate steps to maintain the quality of the items produced. Calibration of temperature sensors, whether performed in-house or contracted to a specialist lab, is an essential part of this activity.